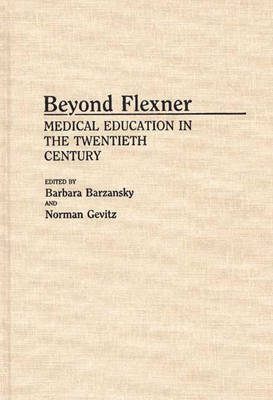 For decades, educators, historians, and social commentators accorded major responsibility for the reform of medical education in the United States to the Flexner Report of 1910. More recently, historians have begun to challenge the impact of the Report and the desirability of the changes attributed to it. This volume takes the themes articulated in the Report and traces their development. With each theme being discussed by a specialist in the subject area, the book provides a comprehensive review of medical education in the twentieth century. These themes, many of which have not been discussed in other books, include the basic sciences, the clinical curriculum, women in medicine, black medical education, and sectarian medical education. In addition, the volume includes chapters on the evolution of the health care delivery system, trends in financing medical education, the use of outpatient settings for clinical education, the current status of the medical curriculum and needed changes, and health manpower needs. The work concludes with a chapter discussing the current proposals for change and how they relate to the problems and reforms of the Flexner era. The work will be of interest to medical school administrators, policy makers, and faculty members as well as to practicing physicians. "What would Abraham Flexner have thought if he could visit us today? Whatever his response, he would not have been shy about letting us know his opinions. And I believe he would have liked this book and urged those involved in the education of young physicians to read it and to think about the issues raised by the many good essays."-Bull. Hist. Med. ?What would Abraham Flexner have thought if he could visit us today? Whatever his response, he would not have been shy about letting us know his opinions. And I believe he would have liked this book and urged those involved in the education of young physicians to read it and to think about the issues raised by the many good essays.?-Bull. Hist. Med.